Home › Dating Advice for Women › Are you always a Bridesmaid? If so, how can you meet an eligible man by attending a wedding? Are you always a Bridesmaid? If so, how can you meet an eligible man by attending a wedding? Wedding season is upon us. Alan and I celebrated our eleventh anniversary last weekend and we had a night away to ourselves at a local resort. When we arrived at the hotel, there was a wedding being set up. It was Saturday, July 20th and when the elevator opened up- there was the bridal party with the bride! What a sweet reminder of our wedding that day. It was a hot, steamy July day in DC just as ours was eleven years ago. First when the wedding (or baby shower) invitation arrives, you can RSVP, “Regretfully I cannot attend”. Depending on how good a friend you are, this could be the end of the friendship. If it is a very close friend, you may even be asked to be a bridesmaid! Thereby you will be compelled to participate fully in the wedding activities. The last choice is to decide that it was a party and a celebration of life. To go and decide to have a good time, to party with your friends, enjoy the food, music and camaraderie. Who knows, you may meet an eligible man for dating. You can ask your friend if there will be any male friends or relatives for you to meet. As it turns out, one of my girlfriends met my sister in law’s husband’s single brother. The ended up going on a date or two. At a wedding there could be plenty of opportunities to meet quality single people. It all goes back to your attitude about life. Looking at life as an adventure, and making the most of the opportunities available to you will serve you better that being upset about your current situation and dragging others down with you. Besides, most people will not stick around you if you are bitching and moaning all the time. Actually, that single girlfriend who met and dating briefly my relative is now in a committed long term relationship. It took her ten years to find her boyfriend and she never gave up believing there was someone out there for her. I admire her perseverance. What wedding stories do you know about where you have met an eligible man for dating? How do you feel about attending your friend’s or cousin’s wedding? This curious coach would like to know! P.S. 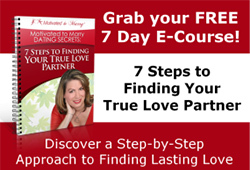 If you would like to learn more about how to meet and connect with the an eligible man for dating, get my free 7 day e-course 7 Steps to Finding Your True Love Partner to the right of this blog post. ‹ Will there be fireworks for you on the 4th? I was at a wedding in August. I made a note of how attractive the groomsman was. I danced at the reception – just trying to have a good time, not trying to make myself visible – but apparently I did in fact do so, as the groomsman in question came over to introduce himself as my extended-family group was getting ready to leave (this is about five hours later — it takes a guy that much time to get it together and just come over to introduce himself? Though maybe this is some sort of improvement, as I stopped going to an event after four years of watching men stare at me from across the room and yet fail to come over and introduce themselves? *sigh). I told him that both the bride and her new groom had both my phone number and my email address, and I was reachable that way. He told me “Oh, they have *my* contact information too.” I told him – we’re members of brother and sister organizations – that the men I knew from that organization were men of action, and so I was looking forward to hearing from him. This man turned out to be a cousin of the bride. He was mentioned at a Labor Day celebration neither he nor I attended, but my mother and the bride did. The bride called her cousin in my mom’s presence to remind him that he and I had met. He apparently told her he was still waiting to hear from me. And I still have yet to hear from him. The secondary problem I have is that everyone else in our circle seems to be okay with that, since men have gradually been conditioned out of making any effort with women, and have become totally comfortable with letting women make all the effort and do all the work. The primary problem I have is that I wouldn’t have spent all this time even relating such a narrative if I weren’t having such a difficult time meeting men who were otherwise suitable – reasonably hardworking, reasonably intelligent, reasonably attractive, and actually available. As a hardworking, intelligent, available, reasonably attractive woman, I find myself struggling to figure out — I mean, why did it take five hours for the man to come over and introduce himself?? — why it has to be this hard. Yes, it’s frustrating. You want a man to take action. This is not the guy for you. He may fear rejection or have self esteem issues. He may not really be looking for a relationship. If one came along, then he would go with it. What I know about these men, they do find women who are drivers and they run the show. The right man knows what he wants and how to go after it. It is just not a good fit. I am not sure what age range you are in either. The under 35 are more egalitarian about things.